Volunteer - How Can You Help? Front Row: Lou Sniderman, Susan Major and Carolynn Kavanagh. Back Row: Club Co-Presidents Rocki Fimmel and Cheri Sargent. 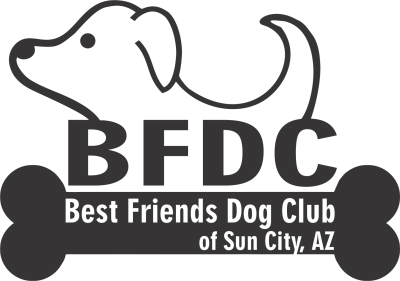 If you would like to become a member of the Best Friends Dog Club of Sun City. Must show current recreation card for each member. You do not have to have a dog to become a member of the club. If you have a dog or dogs, they must be socialized to participate in club activities. Annual dues are payable when you become a member. Membership dues are $10.00 per year per person. Please attend any of our events to join BFDC. Please see our calendar for events and bring along both your RCSC member card and a check for $10 for each person who is joining the club​. Volunteers help with activities! Events! Volunteers Serve on a committee or become chairman person? We have lots going on and you can be a part of all of this.